Preschool – 8th grade. 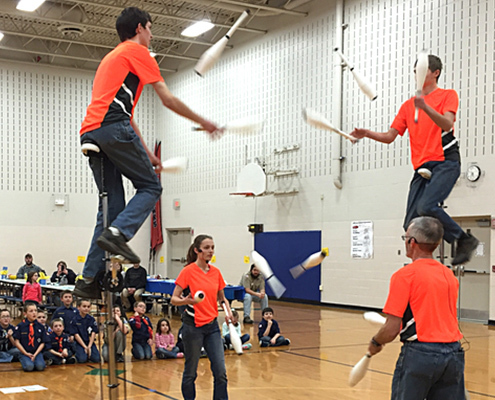 You may register by giving us a call, stopping by the library, or signing up on our website www.alton.lib.ia.us Children of all ages are invited to the Kickoff featuring the Hanson Family Jugglers on Tuesday, June 7 at 1:00 pm. The Alton Public Library is excited to present the Hanson Family from Kanawha, Iowa to perform their 2016 Summer Reading Program show on next week Tuesday, June 7 at 1:00 pm. 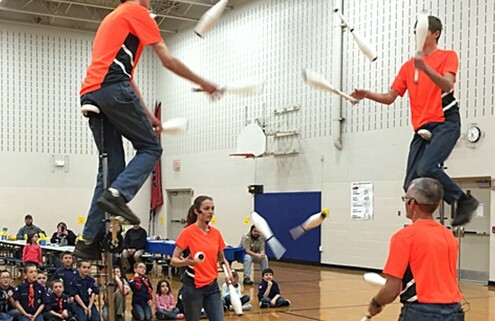 Mark Hanson, a two-time Guinness World Record holder for speed juggling, his national unicycle champion daughter, Christa, and the rest of the Hanson Family are bringing their talents to the Alton Public Library to share their “Recycled Fun” library program. Bring your kids to hear inspiring stories and watch the Hanson Family perform juggling and unicycle tricks that they have showcased on two occasions for the world famous Harlem Globetrotters basketball team. Discover how to improve yourself through reading and improve the world with unusually fun recycling ideas. The Hanson Family has performed for thousands of kids at libraries, schools and at fairs and festivals for many years. Please visit the Hanson Family website at www.HansonShows.com for more information about their shows. The Alton Public Library would like to invite all adults interested in playing cards to come on Tuesday afternoons at 1:30 pm. Cards and hot beverages will be provided. Games played will be decided by those attending. All ages are welcome to attend this weekly program!